On Saturday, I met Jamie at Sports Basement (about 2.5 miles from our apartment) for her 18 miles and my 20-mile run. We set out to mimic the San Francisco Marathon 20-mile course preview run hosted by Run 365 a month or so ago. I was happy to meet up with Jamie and have some company for this long and hilly run! Thankfully, the morning was cool and overcast, and I felt ready to run despite staying up past my bedtime on the Fourth of July. The first half of the run was familiar territory: our apartment down Marina Green to Chrissy Field, and then to Baker Beach via Coastal Trail, and south on 25th Avenue to Golden Gate Park.Thankfully, there were far fewer tourists out (I think most people were home nursing hangovers), and the morning was calm with little wind. Although this section of the course is hilly, this area is very familiar, so I know what I’m in for at every turn. Running in Golden Gate Park was also familiar territory, but unlike Jamie, GGP isn’t my daily or weekly running course, so it was a bit more exciting for me. The park is deceptively hilly, and with the marathon less than three (!) weeks away, I will have to remember to remain calm as the course takes runners around the park in multiple loops. Once we left the park and entered the Haight, the temperature started heating up and I started feeling the half marathon distance we had covered by this point. 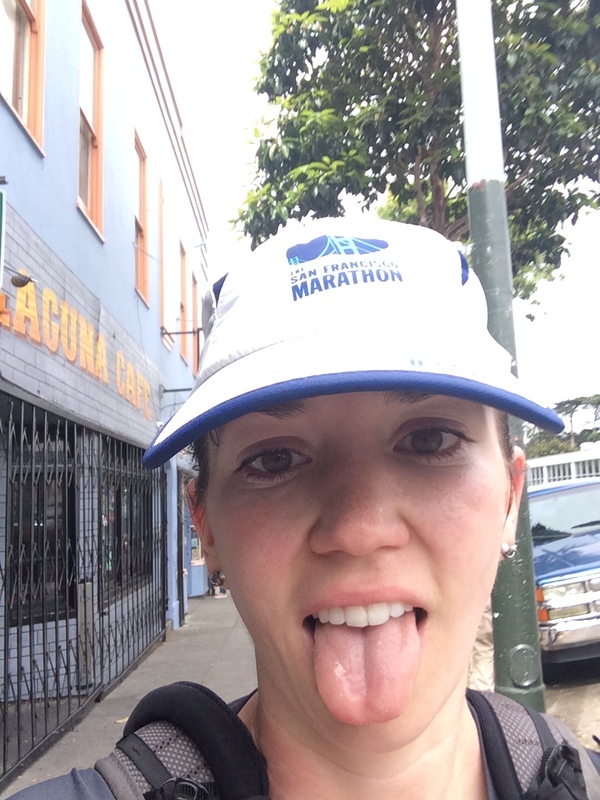 I had never run in the Haight or the Mission before outside of a race, so it was interesting to see this part of the city from a running perspective. Most of this part of the course (save for what feels like a heartbreak hill on 16th Street in the Mission) is flat or downhill. Photo sent to my friend while in the Haight when she asked me if I was done running. 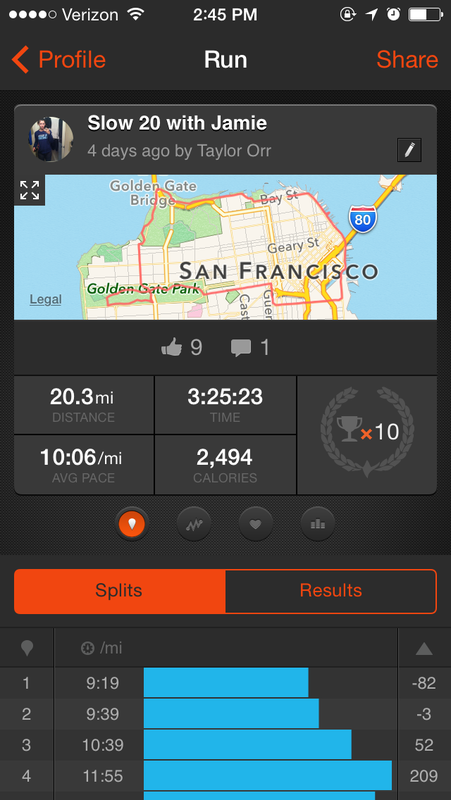 Once we left the Mission, the course flattened out through the industrial and not-so-pretty Dogpatch and Mission Bay. The lack of shade and hunger started catching up to both Jamie and me, but we trudged through the last few miles. At AT&T Park, I had a 5K left, and we spent the rest of the run dodging tourists, with a particularly large congregation of pedestrians at the Ferry Building Farmers Market. Lateral movement and the congestion were mentally and physically tough, but we finished strong! Now it’s time for the taper! Jamie and I have an 8-mile run scheduled for the weekend before the race, and I’m really looking forward to a short and sweet run with her. Great work Taylor!! It is nice to have a running partner for a 20 miler. Awesome to be able to train on the course as well!! Hopefully it will be cooler race day as well!! A trick that I have learned training for marathons is to have a little bit of a solid between miles 18-20(and a little earlier when on training runs) to keep the hunger away. I like to have a mini snickers bar. I know that some people can’t do that with GI stuff. but other choices could be a mini clif bar/lara bar. Just something more than a gel! 🙂 Happy taper!!! pretty good run! ive followed you on strava aswell hope you dont mind. Enjoy taper! At least you won’t be dodging tourists on the day of the race. Only other runners haha. Good luck! Congrats on the 20! Enjoy the taper! You’ve got this!